After almost a week in Milan visiting family, we're off again. 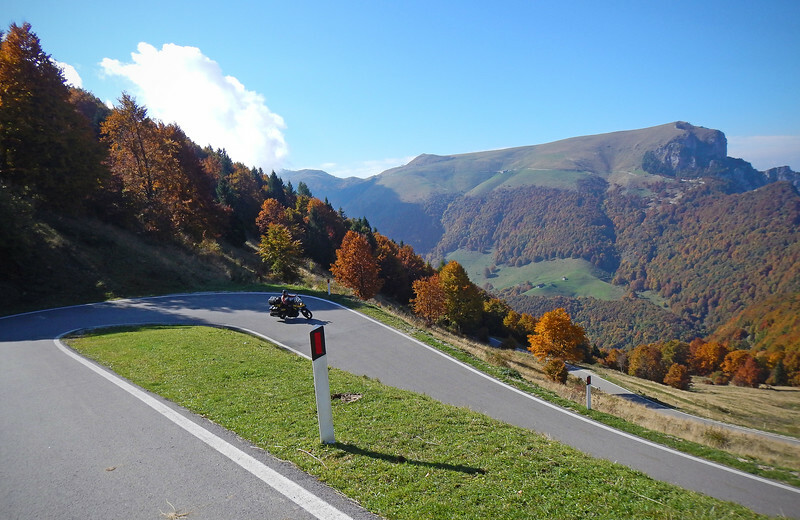 Generally, we're heading south for the winter, but we're taking the scenic route there, zigging and zagging through some of the more entertaining roads along the way. 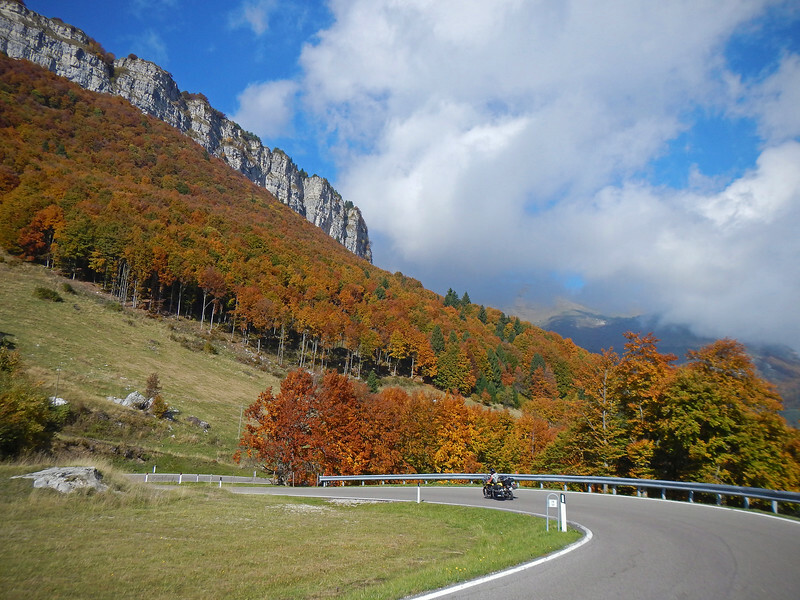 For a change, I took over planning duties and organized a route for us up and back through the Italian Alps, through the Lago Di Garda area in Lombardy. 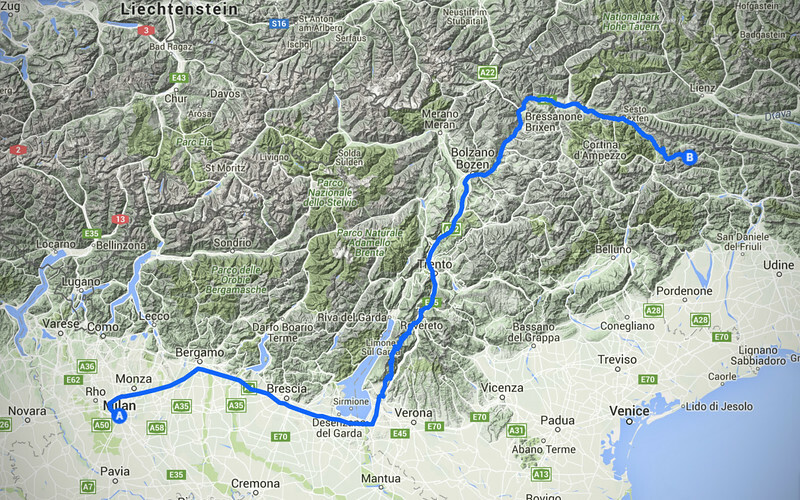 Then we're going to head up to the mountains of the South Tyrol and the Dolomites region of Italy, just south of Austria. 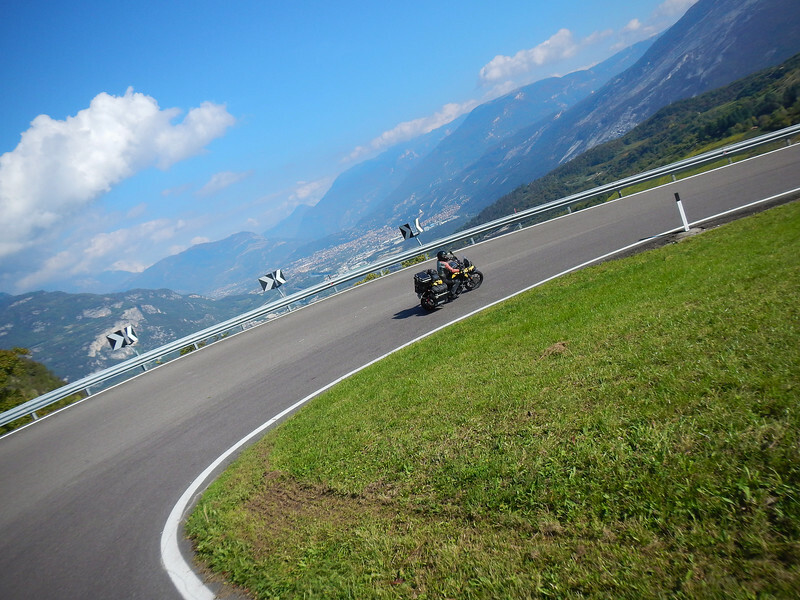 There's supposed to be fantastic riding there and all we want to do is just stay off the highway and take in some twisty roads. 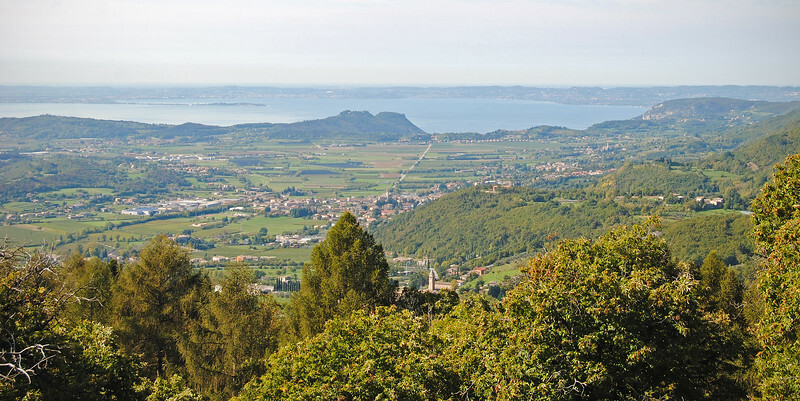 A quick jaunt on the Autostrada takes us past Brescia to the southern edge of Lago di Garda and from there we climb up Monte Baldo, overlooking the eastern shores of Lago di Garda. Such a wide variety of terrain and scenery here! I have to laugh at this picture. There is absolutely no reason why this road has to be shaped this way. 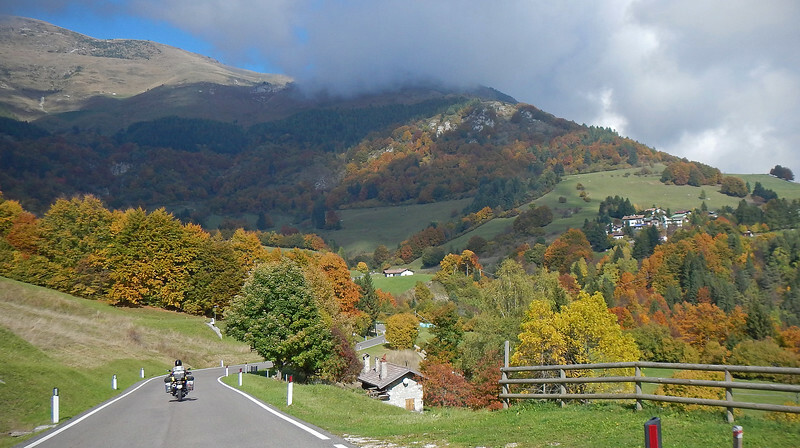 We are so spoiled riding around the mountains in Europe. These staircases of roads seem like they are so commonplace everywhere! 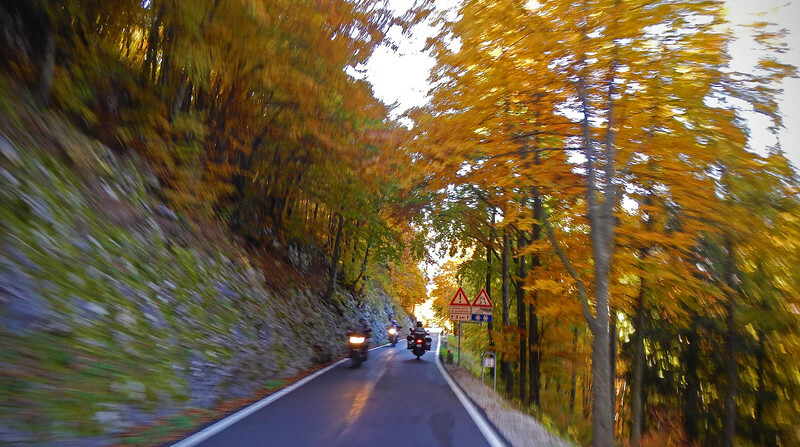 Fellow motorcyclists have the same idea as us. Blurring is natural because my camera's auto-focus is so slow. But it looks cool in this shot! I take a ton of pictures when I'm riding, pulling out my camera when I see something interesting. Because there's a delay between me thinking, "Hey that would make a nice picture" and actually taking the camera out, I miss out on a lot of good shots. This one above was especially heartbreaking because we had just ridden through a series of short tunnels cut through the rock in The Gorge, and we were at the last set when I had the much-belated thought, "Hey this would make a cool picture". So out comes the camera, but because the tunnels go from dark to light so quickly, it takes *forever* for the sensor to auto-focus and I JUST MISSED Neda disappearing into the next tunnel ahead. It would have been such a great shot to have her framed right in front of me in this picture! 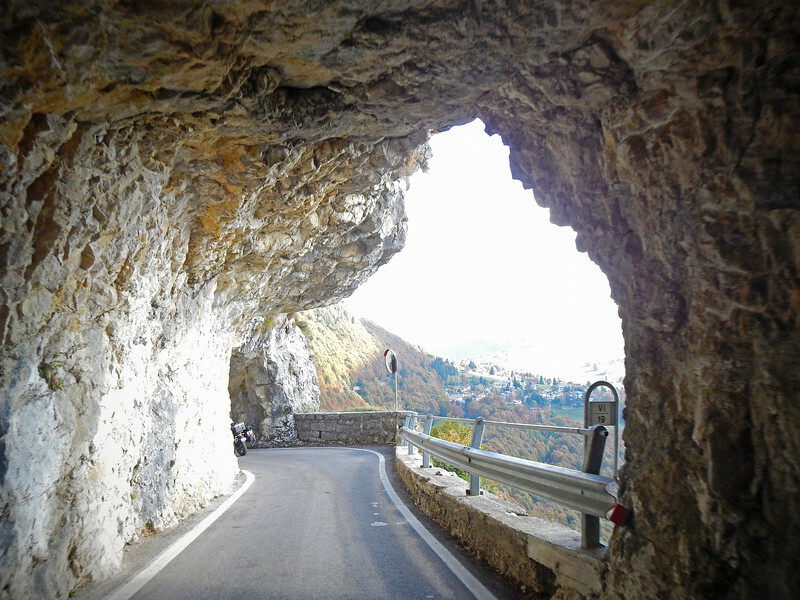 At one point the road carves a narrow path alongside the steep face of the mountain. Slate grey peaks covered in greenery peek through a shroud of clouds in the distance, and the valley drops off dramatically beside us. The late autumn trees look like they are on fire in contrast to the brilliant blue sky above - that sky that seems to be borrowed from the summer that we never had. 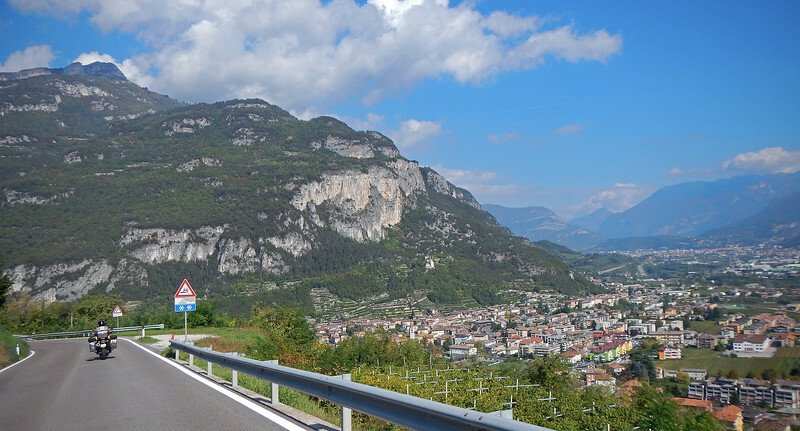 Right about now I'm thinking, "I should really put away the camera and try to make this next turn..."
We are stopping in Rovereto, at the northern end of Lago di Garda, for a late lunch. About a month and a half ago, I got an e-mail from someone in Toronto who keeps up with our blog. He asked to meet with us because he read that we were back in town for the summer. Unfortunately, because our blog is so far behind, we had already returned back to Europe, so we didn't get a chance to connect. But we've kept in touch since and it just so happened that we were now both in the same area. Our mystery host wants to remain anonymous, so no names or pictures, but he fed us lunch and we ended up having quite a lengthy and deep discussion over the kitchen table about our travels. 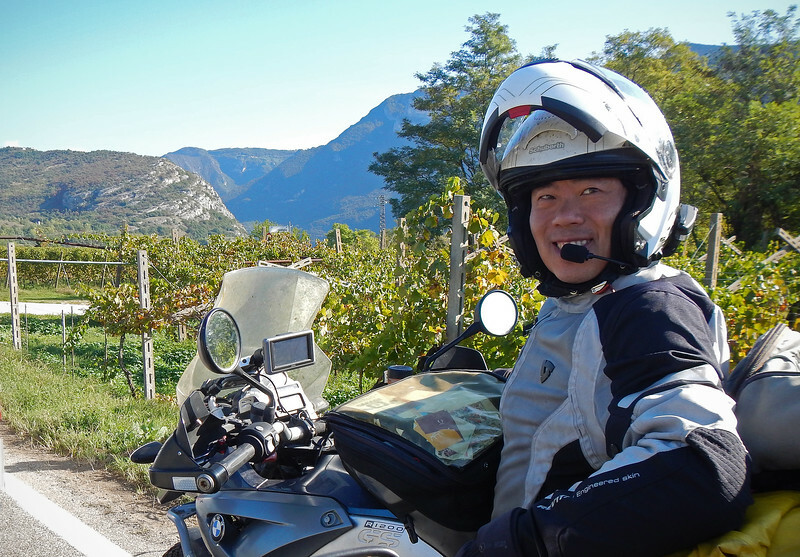 He's also a nomad as well, spending the better part of the last 10 years moving around from place to place, sometimes on a motorcycle, sometimes with a backpack. We have very similar backgrounds, so it was quite a treat to have a Birds of a Feather discussion, getting to share thoughts and experiences about life on the road that somebody else who hasn't done it may not understand or be that sympathetic about. 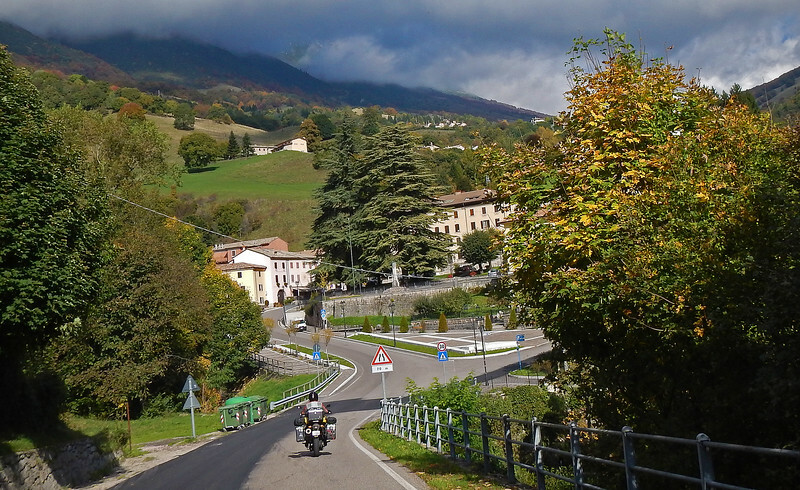 It was with great reluctance that we had to leave this tiny Northern Italian town and our wonderful host. We had already booked an AirBnB much further north. 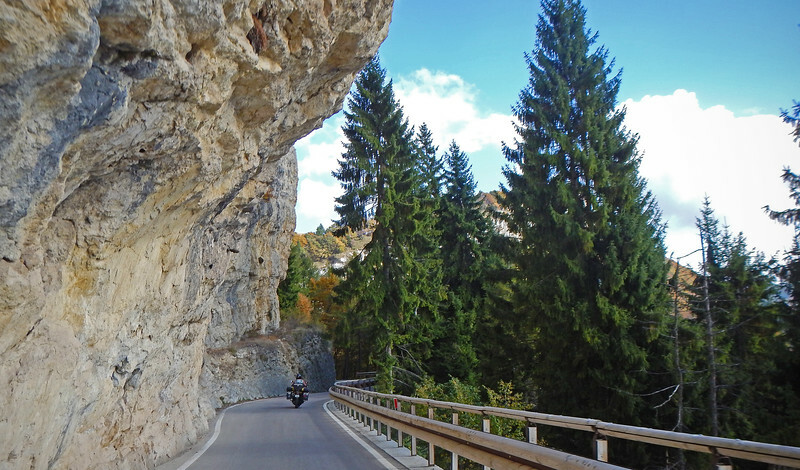 I had originally planned more twisty roads through the Dolomites, but spending further time with like-minded company instead was the absolute correct decision. 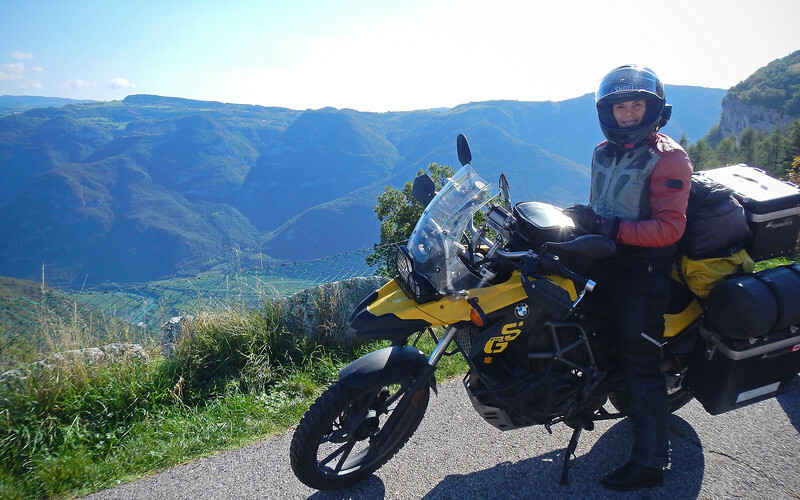 We were now racing against the setting sun which disappears below the mountains of the Alps extra early - as if to add insult to the injury of the shortened daylight hours! The midnight sun in Norway really spoiled us. 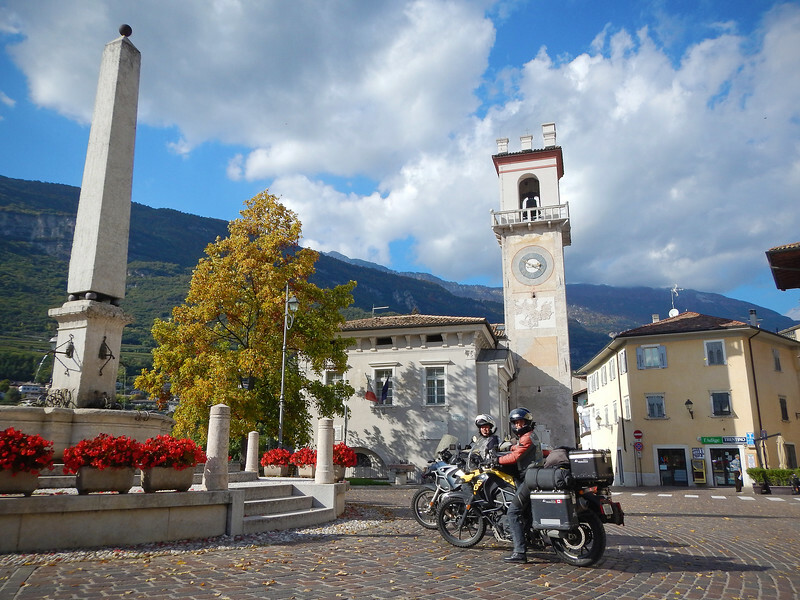 So we said our goodbyes outside in the town square and hopped on the Autostrada past Trento. 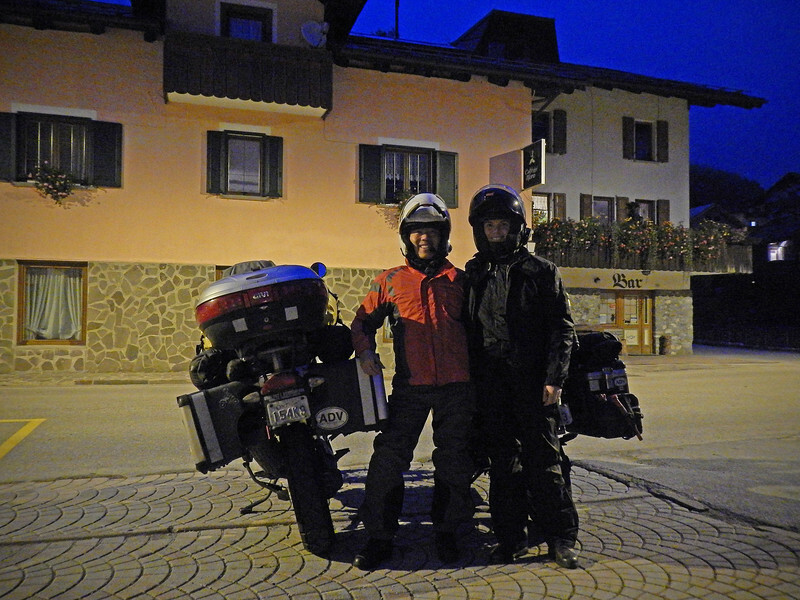 Despite it being a highway, the alpine scenery is still fantastic, but the light was dimming and we arrived in the small village of Sappada in the heart of the Dolomiti in darkness. Not to worry though, plenty of time to explore the area tomorrow! 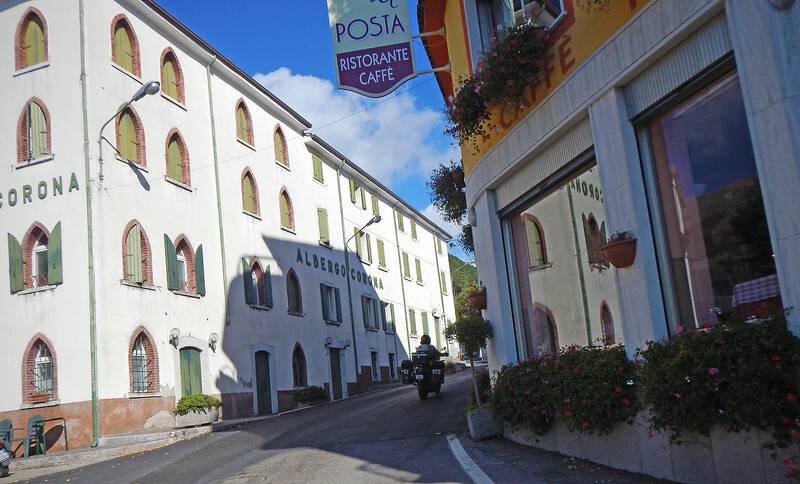 We wait for our AirBnB hosts to meet us on the one street that makes up the tiny town of Sappada. Only 8PM and it's already pitch dark. It was a fantastic day of riding. 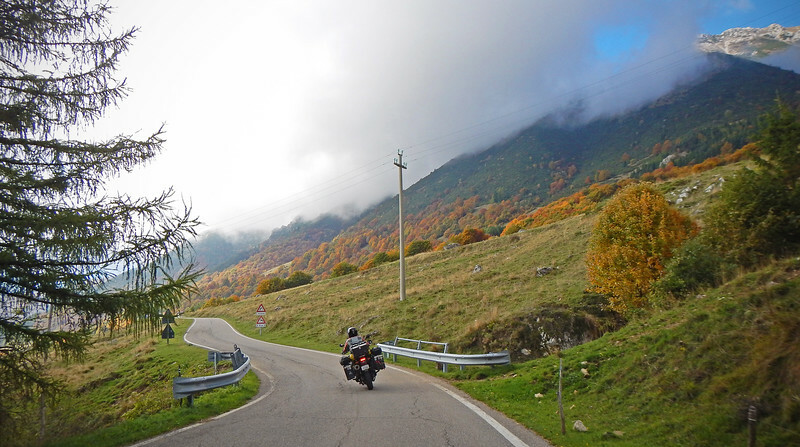 I know in the back of our minds, we're both evaluating the future and where we're going to end up and what we want to be doing, but sometimes just being on the back of a bike and riding some twisty roads for hours on end is the best kind of solution to the problem of thinking just too damn much.